Travis was one good looking guy. Compared to the other men in her life he was the cream of the crop! She couldn't control him so she destroyed him. Thank you CBB!! 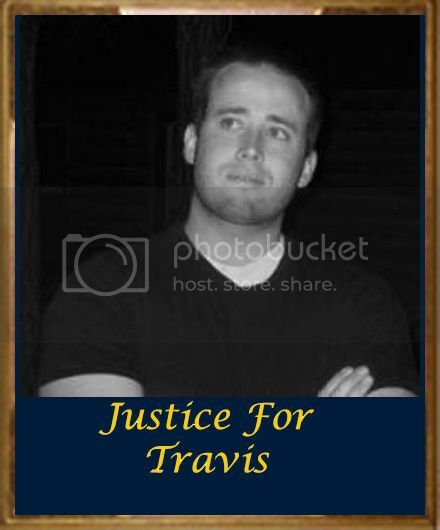 "Justice for Travis"!! Muffy, I think I have the wrong email address for you....I used the gmail one and sent you some pictures to post for me.....if you didn't get them please email me and I will resend them...to the address you email me from (I thought it might be an OLD address...guess I was right!! Never mind I followed the link! DIDNT pros Jeff Ashton write a book! She's off the hook wrong. This is nuts...JM tried his hardest for TA. Are they afraid more truths are going to come out? This family is weird in so many ways and you may have hit the nail on the head. I don't see how it's possible to prevent him from writing a book. I hope he does tell it all someday. If Juan writes a book.......... I'll buy it!! I don't think anyone can keep him from doing it. Baez wrote a book, Ashton wrote a book, Darden and Clark both wrote books after OJ's trial, and I hope Martinez writes one too. Jodi's camp just doesn't want all that Juan knows to come out, IMO, and they don't want him to profit off of the case. Maybe they're thinking of writing a book themselves and don't want the competition. Juan will bring truth to light and the family doesn't want that! I do believe you called that one good. I do think they plan on profiting from a book. I would buy juans book! Nothing they can say will be credible! Considering they are relying on some information from the killer niece. ja's mother, sandy's, twin sister...she was in court nearly every day. In his motion, Martinez responded: "Neither reason warrants a continuance of the proceedings until the first part of next year. Therefore, the court should deny defendant’s request and should instead set trial in the penalty phase for July 30, 2013. This date will accommodate defense counsel’s “out of office” commitments as well as defendant’s desire to call witnesses." Page created in 10.338 seconds with 19 queries.